2019 Annapolis Ten Mile Run entry is OPEN! Registration is now open for summer’s best race– the 44th annual Annapolis Ten Mile Run on Sunday, August 25th! The area’s oldest running race features a scenic course running through downtown Annapolis & surrounding neighborhoods, multiple water stops manned by awesome volunteers from local organizations, fantastic race management by the all-volunteer & non-profit Annapolis Striders running club, individual and team performance awards, and a post-race party featuring live music, food, and adult beverages. Finishers receive a sharp-looking black & blue half-zip pullover top— and we’ve now added a finisher’s medal as well! So visit https://www.active.com/annapolis-md/running/annapolis-10-mile-run-2019 to sign up now and take advantage of our lowest entry fee of the year! Fees go up on April 15th. And see our 2019 Race Information page for complete race details. We can’t wait to see you on August 25th! This entry was posted in 10miles, A-10, Blog, Race, Registration and tagged Announcement on April 1, 2019 by webmaster. fRegistration for the Annapolis Ten Mile Run opens April 1st, 2019 (no fooling). New this year, in addition to the black half-zip pullover finisher’s premium, will be finisher’s medal. Follow the race details at 2019 Annapolis Ten Mile Run Race Info.. See you at the starting line August 25, 2019! This entry was posted in 10miles, A-10, Blog on March 30, 2019 by Cris Eck. Congratulations to everyone who ran the Annapolis Ten Mile Run. The results may be found at https://www.annapolisstriders.org/result/2018-annapolis-10-mile-run-results/. Pictures are also now available from CBMT Creative at https://endurophoto.zenfolio.com/f921634703 . Medium resolution photo downloads are free! Pictured: Left Male Open Winner Jeffrey Stein, right Female Open Winner Julia Roman-Duval. Pictures by Dan Symancyk. This entry was posted in 10miles, A-10 on August 19, 2018 by webmaster. Hello Annapolis 10 Mile Run Participants! This is the final pre-race update regarding the 2018 edition of the A-10, now in its 43rd year. We are only a few days away from the big race! We are so excited to have everyone run our town, and to show it off to you. This is a race put on by runners for runners and we hope you love it, because we sure are working hard behind the scene to make everything run well (no pun intended)! The Annapolis Striders are an all-volunteer, non-profit organization and we are proud to put on this community event, so we hope everyone enjoys the run and celebrates after the run, while listening to the Dana B band and enjoying some hard earned hydration. The weather looks good (as much as we can trust an extended forecast), with appropriate levels of August heat and humidity. There is a chance of rain, so you may want to factor that into your plans. You are running on has course that has hosted Olympic medalists and some of the fastest runners in the country. We want everyone to give their best race day. The volunteers, spectators and emergency services are all there for you. Enjoy being in the spotlight, don’t wear your headphones or earbuds and take it all in. We are all here for you! So everyone can have a smooth event, please read through this update (yes, all the way to the end, including the typos!) Yes, some of it is repetitive, and it is long (some would say way toooooooo long), but at the end we have a cool discussion of the actual race course, mile by mile, and more helpful information that you can shake a stick at! Electronic Registration is closed. There are 3,000 runners entered in the race. For your friends and family that waited until the last minute, in Person Registration will be available at packet pickup on Saturday August 18, 2018 starting at 10 a.m., first come first served. Actual runner must register in person. Registration Fee is $100.00 cash or check accepted. Where is bib pickup? Glad you asked! Join us for the Race expo and bib pickup day at Navy Marine Corps Stadium, 550 Taylor Avenue, Annapolis, MD 21401. You cannot miss it coming off of Route 50 (Rowe Blvd, Route 70 exit), it is on your right hand side about one (1) mile off the exit. I’m more of a visual person, do you have a map of the area? Yes, it is on our Facebook page, as are course maps. We will be open for business Saturday from 10 a.m. to 5 p.m. That doesn’t mean showing up at 9 a.m. and asking for your packet, or standing around at 9:50 a.m. with a scowl on your face, and it doesn’t mean to come running up at 5:15. It takes time to load and unload, so please honor the 10-5 pickup because we are locking up and going to other assigned tasks at 5. Ok, we are actually just going home, but we will be tired…. What do I need at packet pickup? Your bib number, which can be located here: http://www.mdtiming.com/2018/A10-2018-Roster1.TXT or onsite at registration. YOU MUST PRESENT YOUR GOVERNMENT ISSUED PHOTO ID TO PICK UP YOUR PACKET. Pick-ups may be made for friends or family on Saturday only, but a note from the absent runner stating permission PLUS a copy of their government issued photo ID must be presented. Why do we have to know our bib number? Glad you asked! Instead of a time consuming alphabetical registration, we have simplified registration so that bib numbers are assigned without reliance on last names (although you’ll notice that most folks are still in alphabetical order). Let the computers do the work for us, we say. Still confused? Don’t be. We will make sure you get your bib. What will I get at bib pick-up? Your bib, with the timing device attached, a custom running hat and a custom bottle opener. You will have an opportunity to purchase that last minute gels, hydration carriers, shoes and socks. There are many fine restaurants and pubs in Annapolis. Please consider visiting one! For those interested, Calvary United will offer a short (15 minute or so) ecumenical service on Sunday at 6:15 am lead by Pastor Meredith. It will be at the beer/band/awards area, right next to wear you picked up your bib. Jog on over and enjoy the moment. Race Day! What time does the race start? 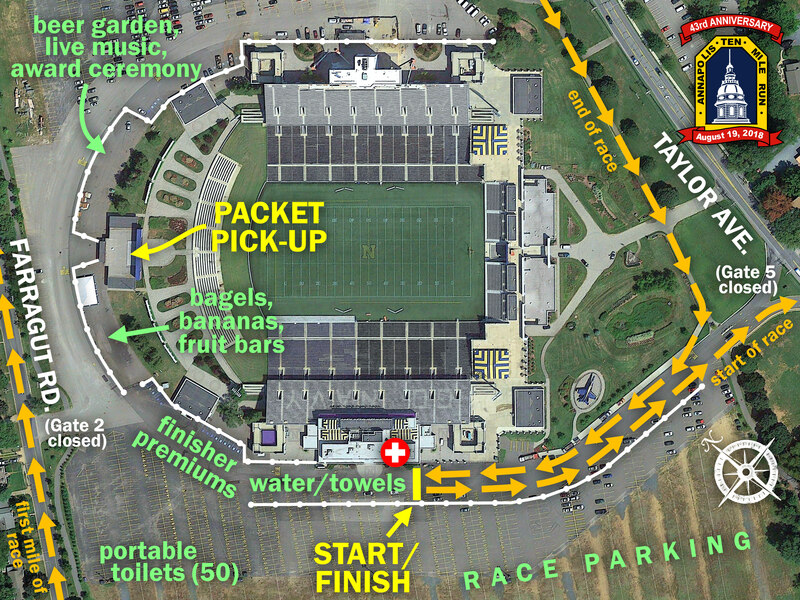 7:00 a.m.That’s right, 7:00 a.m.
Bib pick-up starts at 5:30 a.m. at the Navy-Marine Corps Memorial Stadium. Arrive well before 6:15 a.m. Pick-up lines close at 6:45 a.m., and volunteers are reassigned from registration. Anticipate early morning traffic and long pick-up lines on race day. If at all possible, please get your bib Saturday. DON’T BE LATE! 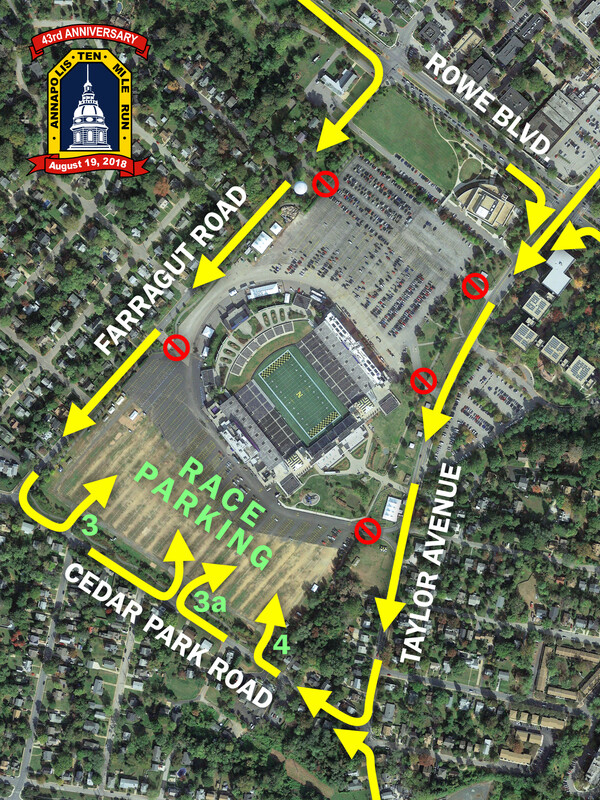 Street closures around the stadium will start around 6:15 in preparation for the race. You must present your ID (or photocopy, so you don’t have to worry about losing your ID. All photocopies will be returned to the person picking up the bib). Bibs will ONLY be given to the registered runner on race day. NO pickups for friends or family can be made on race day. When in doubt, get to the race early, and enjoy our 50 port a potties (and four more on the course). There is also a paved track around the stadium (about 1.25 miles) where you can warm up. Sunday, cars will be directed around to gates 3, 3A, and 4 on Cedar Park Road by signs and you will be directed where to park. There is plenty of parking. Gate 5 (the gate you drove in to get your bib Saturday) will not be open. Why? Because that is part of the course. We do not have water available before the race. Bring some water in your car and hydrate while standing in the port a potty lines. If you park at the stadium, you will never be more than a few hundred yards from your car. If you forget, the 1st water stop is at mile 1.5. There will be no unattended backpacks or other bags permitted in the start/finish and expo areas, or around the Naval Academy stadium; this includes runner and spectator backpacks or bags. The City of Annapolis Police Department will confiscate any unattended backpack or bag. The City of Annapolis Police Department will also have drug and weapon sniffing canines; if a canine has positive smell on a backpack or bag, the race will be stopped while the bag is investigated. So please do not leave your backpack or bags unattended. This applies to spectators and runners. The Annapolis Striders support the effort of law enforcement to make this a safe event for everyone. The race will be electronically timed with a timing chip (IPICO RFID system) on the back of your bib. Do not bend or fold your bib number. Your bib will contain a pull tag for your finisher’s premium. Please do not detach it. The bib does not have to be returned. Timing bibs must be worn as directed to be officially scored, and bib numbers must be worn on the torso, with the bib number visible. Every year someone folds their bib and damages the chip. Don’t be that person! No chip, no time. This race is first and foremost a race. And we take the racing part seriously. Finishing the A-10 is a big accomplishment. No matter your pace per mile, we will be cheering for you as you give your best on race day. In case you are curious, the fastest race time was set back in 1982 by Gary Siriano in a blistering 48:42 (which is 4:52 a mile). Is 2018 the year the record gets broken? Another fun fact, Olympic medalist Matthew Centrowitz won the A-10 in 2006 in 54:59. At the age of 16. Please plan to be in the starting corral at 6:40 a.m. We start at 7 a.m. The start/finish area will be marked by a large arch. We will have pace guides by minutes per mile (8 min/mile, 8:30 min/mile etc). Please line up at the pace you expect to run. Please stay clear of the timing mats at the start.PacersIf you’re aiming for a specific time goal this Sunday and want a little help keeping an even pace Lara Mish and her team of volunteer pacers will be leading pace groups for the following estimated finish times: 1 hour 10 minutes, 1:20, 1:30, 1:40, 1:50, and 2:00. Look for the pacers with their pace signs on race morning– they’ll be gathered by the Blue Angels jet at 6:30 AM. The race course has been officially certified at 10 miles, certification number USATF M13012 LMJ.There will be mile markers every mile, and we will have a timing mat at 5 miles to show how you ran that negative split! Details on the course are at www.annapolisstriders.org, including the official certification map. I’ve run this race every year! I don’t need to look at any stinkin’ map! Cool, we get you. But there is one small change this year. At mile 1.6 or so, where Rowe Blvd. turns into Bladen Street, the incoming lane on Rowe/Bladen is closed, so we will shift/chicane into the outgoing lane and you will make the normal right onto College Avenue and around Church Circle. There will be course monitors there to assist you. You are welcome to run into the “Road Closed” sign, but we don’t recommend it. You will have seven (7!) opportunities for water and Gatorade (lemon/lime). They are at Miles 1.5, 2.0, 3.5, 6.0, 7.0, 8.0 and 9.0! Port a Pots will be at mile 4 and 8. There are no gel or food stations. Among others, we’d like to thank Calvary UMC Church, St. Anne’s Episcopal Church, the USNA Men’s Track Team, the USNA Women’s Track Team, the Severna Park XC teams and Fleet Feet for their support of the aid stations. You can carry your own secret fluid concoctions in a handheld or hydration pack, too. We will have medical volunteers on the course, and at the start/finish, and medical runners (medically trained individuals running the course looking for runners in need) designated by orange first aid vests. When in doubt, please check in with our medical volunteers; they are there for you. If you require medical at the finish area, please alert a volunteer and you will be escorted to the medical area. There will be course monitors and police officers directing traffic. In the City of Annapolis, the race course will mostly be closed to traffic, and most of the roads in the County will be closed too, with the following exceptions. (1) The Naval Academy Bridge will have one lane open for Naval Academy metered (one-way) traffic only, and will be coned for safety. (2) On Route 648 (mile 6 on the course) one lane will be open for metered (one-way) traffic and will be coned for safety. (3) On Route 450 (mile 7), we will have the shoulder and one lane, the other lane will have traffic and will be coned for safety. Follow police and course monitor direction at all times, and leave your headphones at home. It is your responsibility to pay attention on the course. Your race director once didn’t pay attention during a race in an unnamed charming city that reads, ran through a well-controlled intersection with a police officer, and a rogue driver just went through anyway, clipping your RD with the side of her very pretty Cadillac, but we digress. You must complete the race in two hours and thirty minutes (2:30, or 9:30 a.m. real time, 15 minute miles) as road closures will reopen and aid stations will close based on this time constraint. This rule will be STRICTLY ENFORCED, and you will be asked to get in a van, or directed by the police to move to the sidewalk, where you will be subject to all pedestrian rules. Please do not argue with the police or the volunteers, as this is a condition of our permits. And when we say permits, we mean permits. State ones, City ones, County ones, Federal ones…. The course will open to vehicular traffic at 9:30 am. NO headphones (yes, we mean it) Notice this is the third time we’ve said no headphones. You are on a course with volunteers and fans screaming and cheering for you. Why wouldn’t you want to hear that? No wheels (roller blades, bikes, strollers, etc.). No dogs (or cats for that matter, or miniature horses, but bald eagles are cool). You must finish by 9:30 a.m. to receive your finishers premium. Do not leave your pet in your car while you race. Unless you are cool and running with a bald eagle, please leave your pets at home. Hey, what’s the big deal? I can run on someone else’s bib. I mean they paid, right? It’s my right as a runner! Wrong. BIB SWAPPING and BANDITS (non- registered runners) are not permitted. Please do not run on someone else’s bib. It causes timing and award issues (every year), and we do not know who is on the course should a medical emergency arise. Those caught bib swapping or running as a bandit risk future disqualification from the Annapolis 10 Mile Run. The course is fast for the first three miles. Once you get to the bridge at mile 4, it becomes quite hilly until mile 7. Some folks think of the 1st time over the bridge as going into the land of hills, but where there is an uphill, there is a downhill so it all evens out. Or so we’ve been told. At mile 8 you will get to the bridge again, hit one small hill after the bridge (which is an unpleasant surprise) and the course is basically flat until you the last 500 yards or so, which is an uphill finish. Advice: Hold back in the first 3-4 miles, you will need the energy later. You will run downhill, past the Blue Angels jet (this is the hill you will run up at the end), and make a quick right, and then another quick right. You are in essence running around the stadium, which was built in 1959 and in its first event Navy defeated William & Maryin football, 29–2. Go Navy! Did you know that the stadium also hosted soccer games in the 1984 Olympics? Know what all those place names mean? They are famous battles. After the race, you can check out the history of those battles as they are described around the stadium. It is a privilege for us to beable to host our race here. The first half mile is basically flat, then there will a few rolling hills right at the one mile mark. You will forget about them later in the race. Make a quick right onto Rowe Blvd. Run fast here. You will pass the District Court on your right (see the marble columns? They moved them there special several years ago) and then the Courts of Appeal on your right. Just before the bridge will be a water stop on your right next to United Methodist, the nice people who gave the prayer service at the stadium. Go over a bridge over College Creek. If you look to your left, you will see another bridge, which you will cross around mile three. You will pass by the Treasury Building (that’s where they keep the money), and the Senate and Delegate Buildings (that’s where the spend the money). Watch out for the Road Closed sign, or pretend it is a steeplechase race and jump it. Run down hill on Main Street (but look up real quick and you will see the Chesapeake Bay). This is one of the fastest parts of the course. Run fast here. Pass the Maryland Inn (portions built in 1695), Chick and Ruth’s Delly (they say the Pledge of Allegiance every day before breakfast), the Market House, the Alex Haley Memorial, City Dock and the United States Naval Academy, founded in 1845 on reclaimed land. This section is also flat. If you look off way into the distance you will see three 800 foot towers. When built, they were the tallest structures in Maryland, home to pioneers of aviation and conduit for all submarine radio traffic from the Atlantic in WWII. When you get to the College Creek Bridge (after you pass St. John’s College, which was a “free school” in 1696, a military preparatory school and now a great books college) look left, and you may see runners on the bridge you just ran on. Make a right onto 450, and you will see the bridge in the distance. There should be crowds at this intersection. Right before the bridge we will have 4 port a potties on your left, at the Naval Academy pool. This is a congested area with a water stop on both sides. Welcome to the Naval Academy Bridge, built in 1994. Beautiful views from 110 feet up! We just put in the new LED lights. Impressive stuff. If you look right you will see those towers again. Look down and you will see beautiful views of the Academy. Look left and you will see “up” the Severn and the Route 50 Bridge, and down onto Jonas Green Park where the fisherpeople will look up at you with wonder and amazement at your physical prowess. There may be some metered traffic up on the bridge, so stay in your lanes. Follow all instructions on the bridge, which thankfully you will hear because you don’t have on your headphones. Make a quick right after the bridge, cut the apex/corner to go fast and this is where the race gets extra hilly. You will go up a hill (it is steep), and make a right into Ferry Farms (Pretty views to the right of the Academy!) and then a left into Pendennis Mount. It flattens out and then there is a downhill section, but fear not, another uphill is coming. In this section, community water stops are set up, sometimes with oranges and sometimes with hoses to cool you off. This area is shaded. Take advantage of it. Another series of hills, nothing too overwhelming, but they just seem to go on forever. You will run down a hill to the turn around and back up the same hill you just ran down. Doesn’t seem fair, does it. What makes up for it? The communities, who will have impromptu aid stations, and the fact that you are over ½ way done. Oh, and it is shaded, too. And there is a port-a-pottie up here, too. You will make a quick right on Severn Ridge Road, a steep (very steep) downhill, and onto Route 450. Run hard! When you drive 450 it looks flat, but not when you run it. Stick with it, a big downhill is coming past the WWII Memorial, dedicated in 1998. Beautiful view of the sky line of Annapolis here, and the bridge that is looming in front of you. The base of the bridge, push your way up, and you will see the lights of the stadium in the distance. You may feel tired here, but know it will all be over soon. Think of hills as an opportunity to show off your endurance and speed, and look down at those fisherpeople again. This is the time to push, you are so close. At the top of the bridge you will go down (well, of course). Run hard here. A slight downhill, then flat. You will cross over Rowe Blvd (named after a governor) which you ran down 8.5 miles ago (a lifetime!). It’ll all be over soon, and you’ll soon miss the course. As you get closer to the stadium, you will be directed onto a quick right, a path around the stadium and then a quick right up the hill (it is short, but steep), past the jet and into the finish! You may ask, why is the finish on an uphill? Because we wanted our finish line volunteers to be in the shade, it’s hot out there! All Done! You will be handed an icy cold towel to cool down, and can go get your premium. If you have a medical issue, the medical area is right at the finish line. After you get your premium, please move through to the food area. The beer and band are just past the food area. There is a race to see who can get the first beer, so get there quickly! Please don’t try to reverse course and swim upstream back to the finishers’ area. It gets clogged up. CBMT Creative Photography will be out on the course taking pictures, and details regarding previewing and/or obtaining the picture will be on the internet. You will have FREE access and downloads to medium and low resolutions (for social media) of all of your pictures. The high resolution pictures will be available for a nominal cost to you after the race. Your bib will contain a pull tag for your finisher’s premium that indicates your selected size. You will be directed to the premium pick up area to get your jacket, and then directed into the expo and refreshment area. A volunteer will pull your tag, put an X on your bib and hand you the selected size. We repeat, the finisher’s premium is for finishers within the allotted time. You will be given the size/gender you selected at registration. Please do not try on your premium at the premium distribution area as this clogs up the lines (go get some food, water, a massage and a beer instead!). We will have an exchange of remaining stock available starting at 9:45 a.m. at the premium distribution area. Please do not ask for a premium size exchange before 9:45 because you will be told to wait until 9:45, and it makes us sad to have to say no. We are again offering free post race massages, near the bib pick up area! Entertainment by the Dana B. Band, frozen fruit bars, bananas, bagels, & beer. Sales of merchandise and other vendors. What more could you ask for! Stick around for a while and enjoy your accomplishments. The rest of the Sunday chores can wait! You just ran 10 miles….in the heat…and humidity…uphill. The award ceremony will be at approximately 10 a.m. at the bandstand (which is right next to where you picked up your bib). This year we are proud to have custom pottery from Annapolis Pottery. There are no duplicate awards. In other words, if you win the Top masters award, you can’t also win your age group. You’ll get one or the other – not both, and race director decisions are final. Awards are not mailed. If you have to leave early, please designate a person to receive your award for you. Times will be placed near the bandstand as quickly as possible, subject to verification. The times are preliminary until we do the final verifications. This race has been designated an RRCA state championship race. We will have awards the top performing runners in the open, masters (40+), grand masters (50+), and senior grand masters (60+) categories for both men and women. These are in addition to the A-10 awards. Run fast and get two awards? Cool! Volunteers will be wearing a red shirt that says “Volunteer” on the back. The Striders are an all-volunteer organization, and the volunteers on the course and at the expo are volunteers, many of whom are experienced runners and have run the race in years past. We all want to make sure everyone has a great race. If there are any concerns or compliments, please let any volunteer know, but remember, we are all volunteers! Through this race, the Striders are able to donate to many worthy charities. And we thank all the runners who donated to charities at the time of registration, including Historic Annapolis, Maryland Hall for the Creative Arts, Light House, Scenic Rivers Trust, and others! Y’all donated several thousands of dollars for these charities. All registration issues have been laid to rest and the time for deferrals or transfers have passed, and you cannot get a finisher’s premium without finishing. Please don’t ask because we will say no. And that makes us sad to have to say no. And we don’t want to be sad. Even if you are not running the race, you can still get your bib pickup goodies. But not the finisher’s award (gotta finish to get that). We love hearing from you! But we will be busy preparing and directing the race from Friday on and we will have limited time to respond to any emails, or monitor social media. If you have something to say, speak to a volunteer in person. This is a community race, and access to/from the City is impacted by the nature of this race. We have received the cooperation of the communities of Downtown Annapolis, Pendennis Mount, Ferry Farms, Providence, as well as the City of Annapolis, Anne Arundel County, the Naval Academy, Naval Support Activity Annapolis, The Maryland State Police and the State Highway Administration, and the businesses impacted along the way. We are very thankful to our community for letting us show off our city to each of you. Our volunteers will be on the course and at the stadium from 2 a.m. on (yes, 2 a.m.) on. So, when you are on the race course, please thank the volunteers, the police officers, and the members of the public who are out there cheering you on, and keeping you safe! And if you are bored on Saturday night waiting for the race to start, check out our web page and the A-10 archives. You can see all the history and premium throughout the years. Cool stuff. Have positive thoughts, no matter what. Something may go wrong race day (I didn’t get my warm up mile in, the Gatorade is a little strong, why do they have 9 ounce cups? I like 10 ounce cups! That mile marker is .000009 off, that volunteer looked at me funny, why do I have to park here, etc…. ), just stay positive and enjoy the day. Life is imperfect. Or in the words of Herman Munster, life is real, life is earnest; if you are cold, turn up the furnace. Seriously, have a great time, and give your best on race day, because all the volunteers, spectators and police are out there for you! Still reading? Great! Thanks again for choosing to run our race! See you Saturday and Sunday! Thanks, your friends at the Annapolis 10 Mile Run. This entry was posted in A-10, Blog, Uncategorized on August 16, 2018 by webmaster. Avoid packet pick-up lines on Sunday morning by visiting the Annapolis Ten Mile Run Expo at Navy–Marine Corps Memorial Stadium on Saturday (8/26) between 10 AM & 5 PM! Enter through Gate 5 off of Taylor Avenue (parking is free), pick up your bib number and premiums (hat & bottle opener), and check out our many vendors & exhibitors, including The National Running Center, Annapolis Running Shop, Annapolis Family Physical Therapy, Athletes Serving Athletes, Charm City Run Annapolis, kinesio tape specialist Dr. Patti DeNardo, Fleet Feet Sports Annapolis, Girls on the Run of the Greater Chesapeake, GYMGUYZ Annapolis, Heartstrong Foundation, IDLife, Dr. Raymond Infanti from Chiro 1st Chiropractic, No Sweat! car seat covers, RASA Juice Shop, Spunkwear, Summit To Soul, Travis Manion Foundation (9/11 Heroes Run), Wreaths Across America at Crownsville Veterans Cemetery, The Y in Central Maryland, and, of course, the Annapolis Striders! Where’s everything gonna be on race morning?,” you ask? Look no further than these maps of Navy–Marine Corps Memorial Stadium showing our parking entrances and the general race layout! On Sunday morning we will be using parking lot Gates 3, 3A, and 4 only, all off of Cedar Park Road. (Gate 5, open for Saturday’s expo, will NOT be open on Sunday.) There will be a few thousand other runners, spectators, & volunteers converging on the stadium around the same time, so anticipate traffic & show up early! Parking is free; volunteers will help get you parked. Roads will begin to close around the stadium at 6:45 am. A list of the race morning road closures may be found here. Follow the Annapolis Ten Mile Run on Facebook for any last minute announcements. This entry was posted in A-10, Blog, Race, Registration on August 16, 2018 by webmaster. The Annapolis Ten Mile Run Registration is open now! Register here to participate in the 2018 Race starting on April 15th and check out the full race details on this site. This entry was posted in 10miles, A-10, Race, Registration on March 21, 2018 by webmaster. This entry was posted in A-10, Blog, Race, Registration on August 25, 2017 by webmaster. This weekend’s weather is looking perfect for a run through Annapolis. If you haven’t registered yet, do it now. Online registration closes after Thursday August 24th. If we have any slots left after tomorrow, you may register at the expo Saturday August 26th. Visit our race page to get the registration and expo details. Registrants can verify their registration from active.com by going to https://myevents.active.com/. You can also get your bib number directly from MD Timing. If you don’t find your bib number, please contact the race director at a10@annapolisstriders.org. This entry was posted in A-10, Blog, Race, Registration on August 23, 2017 by webmaster. Runners and spectators can park at the Navy-Marine Corps Memorial Stadium. Everyone parking at the stadium should arrive well ahead of the 7am start. Street closures will begin at 6:45 am at the stadium. Parking will be on the south side of the stadium through Gates 3, 3A, and 4, all off of Cedar Park Road. We do not have bag check for this race. Please leave your belongings in your vehicle. Parking is adjacent to the start and finish line. No unattended backpacks or other bags permitted in the start/finish and expo areas. The City of Annapolis Police Department will confiscate any unattended backpack or bag. The City of Annapolis Police Department will also have drug and weapon sniffing canines; if a canine has positive smell on a backpack or bag, the race will be stopped while the bag is investigated. Please do not leave your pet in your car while you race! Better yet please leave your pets at home. Below are various temporary street closures and detours. NOTE: Traffic will be able to travel in and out of Rowe Boulevard by way of a detour around the Navy-Marine Corps Memorial Stadium. Police will be stationed at the Rowe intersections (Farragut Road/Rowe Boulevard and Herbert Sachs/Rowe Boulevard) to direct people. This entry was posted in A-10, Blog on August 23, 2017 by webmaster. The Annapolis Striders Ten Mile Run is over 85% full! Thank you to those who have registered. The registration fee will increase on August 20th to $85 so register NOW! Registered but unable to run? Registration deferral or transfer is now available. Check out the race page for instructions. This entry was posted in A-10, Registration on July 18, 2017 by webmaster.